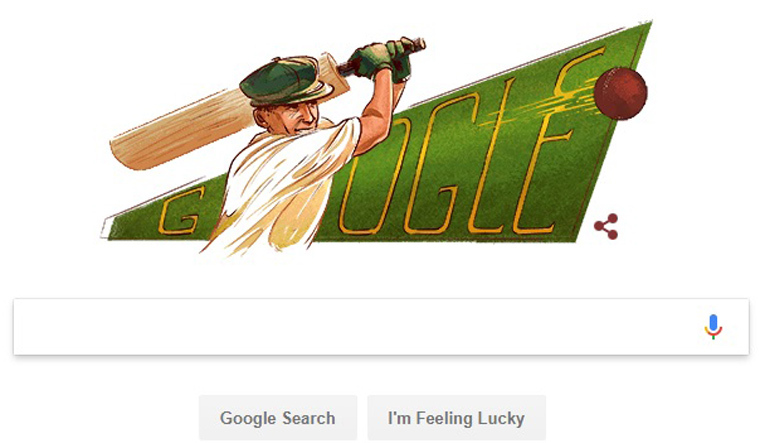 Google dedicated a doodle to the late Australian cricketer Sir Don Bradman on the occasion of his 110th birth anniversary on Monday. Bradman, who was born Donald George Bradman on August 27, 1908 in Cootamundra in New South Wales, was considered one of the greatest batsmen in the history of cricket. Known as “The Don”, Bradman is the only cricketer to have a Test batting average of 99.94, an achievement that remains unequalled to this day. In his 20-year career, Bradman played 338 first-class innings, scoring 28,067 runs at an average of 95.14. He also scored 29 Test hundreds. Bradman is the first batsman in Test history to score two triple centuries. Bradman is also famous for captaining an Australian team known an “The Invincibles” on a record-breaking tour of England post a hiatus following the second World War. He continues to hold several records, including highest series batting average and highest ratio of centuries among others. Bradman continued his association with cricket after retirement for several years by acting as administrator, selector etc. The cricketer passed away on February 25, 2001 at the age of 92 after being hospitalised with pneumonia. The Australian government honoured Bradman by having his image on postage stamps and coins. He is recognised as a national icon and even has a museum dedicated to his life.